The fiscal cliff deal took care of some longstanding tax hassles, and preserved key credits and deductions for most. WASHINGTON — Taxpayers preparing to file their 2012 returns can breathe a collective sigh of relief. The alternative minimum tax, or AMT, has been patched — permanently — and numerous tax credits and deductions that technically expired at the end of 2011 were extended as part of the fiscal cliff legislation that Congress passed and President Barack Obama signed into law in January. 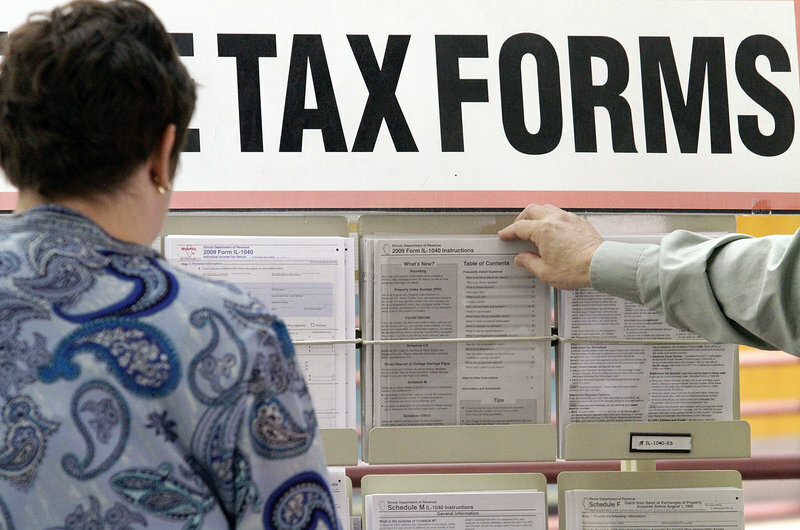 Going it alone on tax day could be costly. Experts recommend seeking some guidance, whether it’s from a professional tax preparer, up-to-date software program or tax guide. More than 90 percent of taxpayers go to a tax preparer or use tax software to file their returns, estimated Jim Buttonow, a 20-year veteran of the Internal Revenue Service who is now vice president of products for New River Innovation, a tax technology company. The IRS will begin accepting returns on Jan. 30, an eight-day delay necessitated by the late congressional action. Taxpayers claiming energy credits, depreciation of property or general business credits will need to wait, until late February or March, while the IRS updates its forms and systems. Last year, the IRS received more than 148 million returns. Electronic filing reached 80 percent for the first time, an upward trend that tax experts expect to continue. All told, in 2012, more than 119 million returns were filed electronically, up 6.6 percent from the year before. More than 110 million people received refunds last year totaling nearly $310 billion. The average refund was $2,803, slightly less than in 2011, according to the IRS. About two-thirds of taxpayers claim the standard deduction, according to Barbara Weltman, a contributing author to J.K. Lasser’s Tax Guide 2013. Each exemption is worth $3,800 this year, up from $3,700 in 2011. Look expansively at dependents beyond your children under 19, or 24 if in college. For example, if you’re paying more than half the support for your parents and their taxable income is less than the $3,800 exemption, you might be able to claim them as dependents, even if they’re not living in your home. There also are higher mileage rate deductions this year — 55.5 cents per mile if you use your car for business, 23 cents per mile for moving or medical issues, and 14 cents a mile for charity. And don’t forget planning for retirement. You can contribute up to $5,000 to a traditional individual retirement account — $6,000 for people age 50 and older — and reduce your income by that amount. If you haven’t made a contribution yet, there’s still time. You have until April 15, the tax filing deadline. The fiscal cliff legislation also extended tax law provisions allowing people 70½ or older to transfer tax-free up to $100,000 from their IRAs to eligible charities. If they do it by Jan. 31, they can claim the deduction on their 2012 tax returns. Dozens of credits and deductions that impact 2012 taxes had been due to expire at the end of 2011, but were extended as part of the legislation that restored the Bush tax cuts for most taxpayers. The measure breathed new life into deductions for state and local sales taxes, and an array of education-related credits and deductions. Then there is the AMT patch. Originally set up to make sure millionaires were paying taxes, increasing numbers of middle-class taxpayers are now being caught up in the AMT. The tax has been adjusted for inflation every year, but the last patch expired at the end of 2011. Without a new one, Miller said in a letter to Congress last fall, about 33 million taxpayers would have to pay the AMT in 2012, up from about 4 million in 2011. Note, however, that many deductions and credits phase out at higher incomes. Taxpayers will have the choice of deducting state and local sales taxes instead of state and local income taxes. This is especially important to residents of states like Florida, which don’t have an income tax. Be sure you know what tax credits and benefits you’re eligible for. No one wants to pay more than is required. “You certainly want to understand the tax law,” Steber said. “Look to life changes” like retirement, losing a job, getting married, having a child or having an elderly parent move in.